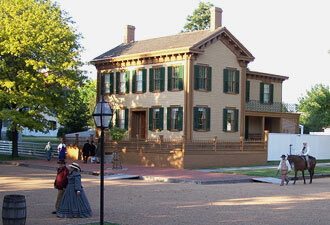 Young Abraham Lincoln arrived in Springfield with little money for a place to stay, carrying what possessions he had. Twenty-four years later, President-elect Lincoln boarded a train headed for the White House and the pages of history. Abraham Lincoln's remarkable rise to the presidency epitomizes the American Dream, and his achievements continue to inspire hundreds of thousands of visitors who make their way to Springfield, Illinois, to see his hometown and immerse themselves in his story. There's no better place to do so than the comfortable home on the corner of Eighth and Jackson Streets, the only home Lincoln ever owned, preserved today as part of Lincoln Home National Historic Site. Begin your visit in the Lincoln Home Visitor Center, where you can take in the park's popular new film, Abraham Lincoln: A Journey to Greatness. The film brings history to life and gives a vivid portrait of the humble man who rose to the highest office in the land. 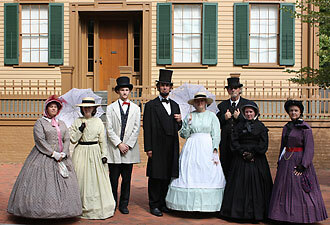 Also in the visitor center, you can schedule a ranger-led tour of the Lincoln home. Built in 1839, the two-story frame house was the home of Lincoln, his wife, Mary, and their four sons from 1844 until Lincoln was elected president and left for the White House in early 1861. The house, along with the surrounding four-block area, has been carefully restored to its 1860 appearance and reveals Lincoln as a husband, father, and neighbor. The ranger-led tours focus on the Lincoln family in the 17 years they resided in the house, highlighting the struggles and successes of a mid-19th-century family, including Lincoln's campaign and election as the 16th president in 1860. Tours run daily between 9 a.m. and 4:30 p.m. Admission to tour the house is free, but tickets are issued on a first-come, first-served basis. Feel like strolling? Follow in Lincoln's footsteps. Thanks to wooden boardwalks, gravel streets, picket fences, and period wagons, visitors are transported back to the 19th-century neighborhood that Lincoln called home. The neighborhood contains several exhibits, including “What a Pleasant Home Abe Lincoln Has” in the Dean House, which focuses on the Lincoln family's life in Springfield, and “If These Walls Could Talk” in the Arnold House, which focuses on historic preservation. During the summer, Lincoln's neighborhood springs to life with costumed interpreters and volunteers portraying 1860s Springfield. To learn more, you might want to tune into the park's audio cell phone tour of the neighborhood. This free service offers a brief history of many of the homes, as well as a glimpse into the life of some of Lincoln's neighbors. On February 11, 1861, President-elect Lincoln boarded the train for Washington, D.C., and bade farewell to Springfield. “To this place, and to the kindness of these people, I owe everything…” he said. 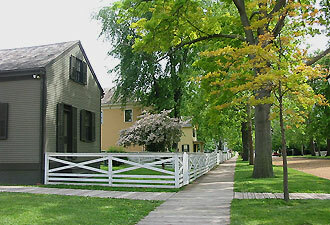 Lincoln Home National Historic Site is open year-round, seven days a week, except for Thanksgiving, December 25, and January 1. Admission is free. To learn more about Lincoln Home National Historic Site and the programs and events offered throughout the year, visit the park's website. For more information about other Lincoln sites in Springfield, visit www.visit-springfieldillinois.com.